Welcome to Ron Buchanan’s family-operated automotive service centre where you and your vehicle’s needs are our top priority. Established in 1984, Ron’s Auto was a dream come true for Ron Buchanan. It had always been his mission to provide affordable, quality automotive service to people in a way that addresses customer’s questions and concerns about their vehicle’s repairs or regular maintenance. Ron’s down-to-earth approach puts you at ease the moment you walk through the door. And you’ll quickly realize that Ron’s Auto stands for integrity, honesty and accountability. What’s happening with your vehicle? ~ Ron stands by his commitment to his customers by listening to their description of the issues that are happening with their vehicle and taking customers seriously. Ron’s team of experienced service technicians will examine the vehicle from top to bottom and confirm exactly what needs to be done, how long it will take and a quote of the costs involved. Why trust Ron’s Auto Service? ~ Ron’s philosophy is that Ron’s Auto is working for you. It is the service centre’s responsibility to provide an accurate assessment of mechanical issues and the service that may be required. Repair and maintenance costs are affordable and competitive. So much so, that Ron’s Auto does not need to depend on gimmicks or promotions to attract business. Never at a loss for words, Ron will always tell you like it is when it comes to your vehicle, strike up a conversation about what’s happening with you and yours, or catch up on what’s happening locally in the community. And once you’ve been to the service centre, you’ve become an official member of Ron’s Auto family. 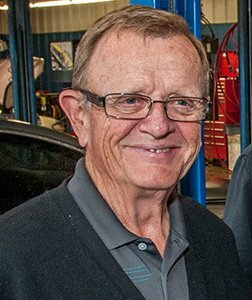 Originally from Huron County, Ron began his career in the automotive trade at a shop in Goderich in 1966. Moving to St. Thomas in 1968 he spent ten years at an AMC dealership and a GM dealership. He moved on to Canadian Tire as a service manager. Feeling limited by the corporate strategy, he dreamed of owning his own shop so he could do things his own way. He broke away in 1984, opening his own shop on Talbot Street, with his wife Mary. 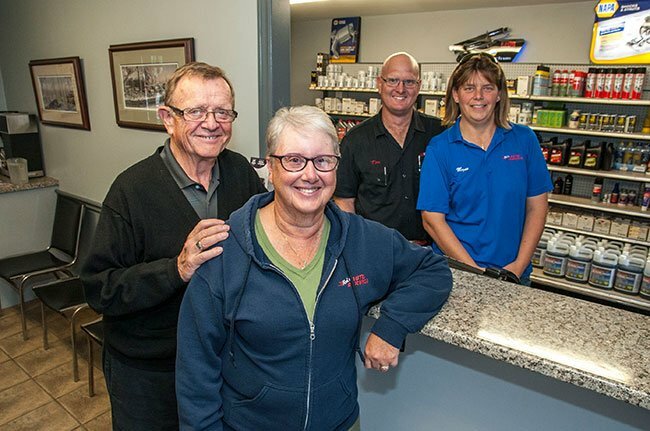 When a fantastic opportunity presented itself three years later, they decided to move the shop from the downtown core and build a five bay shop at the present location on Edward Street. 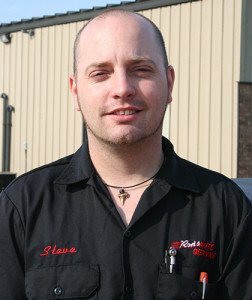 Ron’s son, Tim, has extensive training and experience in the automotive service industry. 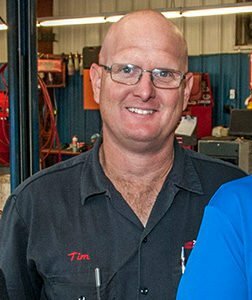 Tim has developed an essential combination of contemporary auto service practices and technology while also practicing his father’s successful business and management traditions that have shaped Ron’s Auto Service. 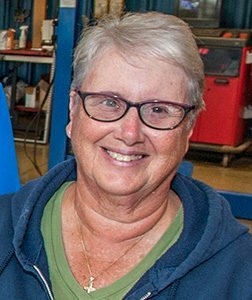 Mary has stood by her husband, Ron, since Ron’s Auto Service first opened. Retiring her career as a hair stylist, Mary joined the family business and rapidly became affectionately known as “Madame President.” And rightly so as Mary is the numbers manager taking care of the business of Bookkeeping and Accounting. 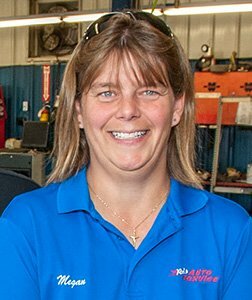 Tim’s wife, Megan joined Ron’s Auto in 2013. Megan has been invaluable in the areas of Accounts Receivable, Bookkeeping and Parts Receiving. After successful completion of an Office Essentials Course, Megan is able to offer vital computer support to the business as well. 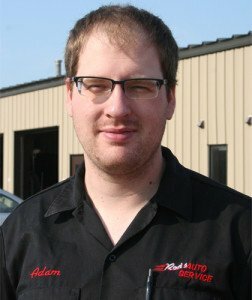 Adam came to Ron’s Auto Service as a third year apprentice. He acquired significant knowledge and experience in Moorseville, North Carolina, spending two years at the NASCAR Technical Institute after graduating from Parkside High School. He secured his license from Fanshawe College in 2014. Steve served his entire apprenticeship at Ron’s Auto Service joining the shop directly out of the automotive program at Arthur Voaden Secondary School. He has been employed at the shop for sixteen years, earning his license in 2005. He is an invaluable asset in many areas of the shop.